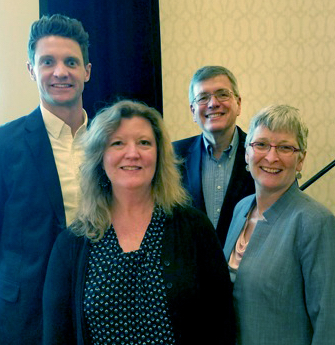 Editor’s note: Fuentek vice president Becky Stoughton (front) served as moderator with panelists (left to right) Justin Anderson of the Wisconsin Alumni Research Foundation (WARF), which is the technology transfer arm of the University of Wisconsin–Madison; Steven Ferguson of the Office of Technology Transfer of the National Institutes of Health (NIH); and Lesley Millar-Nicholson of the Technology Licensing Office (TLO) at the Massachusetts Institute of Technology (MIT). A recurring theme at this year’s AUTM national meeting was the expanding role of technology transfer offices (TTOs), as they are expected to do more and more that falls outside the traditional areas of protecting and licensing intellectual property (IP). For example, at a growing number of universities, TTOs are being asked to educate students about protecting IP, evaluating a technology’s market potential, licensing, and so forth. This is familiar territory for Fuentek, having blogged extensively about our experiences setting up effective tech transfer internship programs and on the connection between tech transfer and successful startups. And given the significant career accomplishments that had their origins in a TTO internship, we knew that such efforts can have a long-term impact. What was surprising was the growing levels of training available to current and future tech transfer professionals. 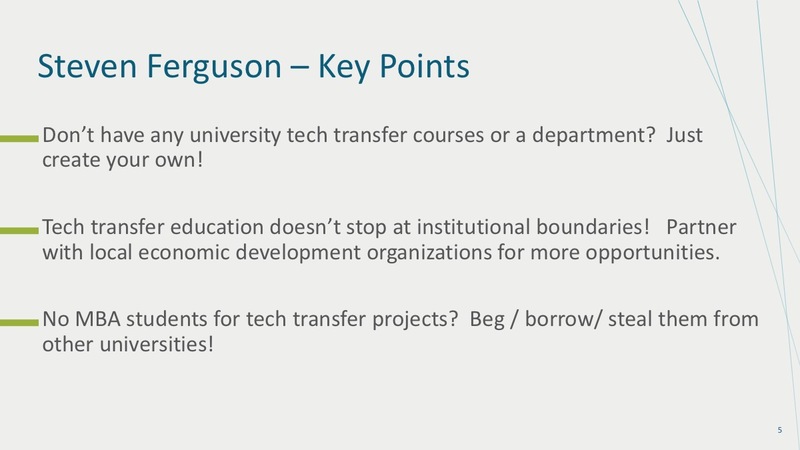 A quick poll of the audience at the AUTM session showed that no one had a degree in tech transfer, though a few schools now offer them. A scattered few in the audience had a certificate. The vast majority had learned their trade on the job, augmenting with courses offered by AUTM or Tech Transfer Central webinars. It will be interesting to see how these numbers change in the next decade, thanks to the efforts of the panelists and others—and (I hope) those inspired by the session—to professionalize the profession. Offered through NIH’s Foundation for Advanced Education in the Sciences (FAES), the Advanced Studies in Technology Transfer program is designed to educate not only scientists and engineers but also current tech transfer professionals. And thanks to NIH’s partnerships with universities, credits earned through this program can be applied toward an MS or MBA. Proposed jointly by the TLO and a chemical engineering professor, this course is being developed under a grant from MITx. A 17-session IP Lunch and Learn Series was offered during MIT’s 4-week Independent Activities Period this past January. The Patent Scout search tool is available free to the MIT community. Martin Trust Center for MIT Entrepreneurship offers an Accelerator and other initiatives. WARF has a long history of involving students in its work. For example, in addition to a more traditional internship program, WARF features the Ambassadors program, which uses graduate students and postdocs to boost engagement with campus researchers. WARF also supports student outreach beyond the walls of the university. The Business and Entrepreneurship Clinic and the Law and Entrepreneurship Clinic provide services to Wisconsin-based entrepreneurs and nascent businesses via MBA and law students. Entrepreneurons presentations focus on bringing the fundamentals of getting a new venture started to the UW-Madison community. Essential Topics is a lecture series focused on a range of issues related to research and IP. Each of the three panelists offered a slide of tips (used here with their permission). In addition to partnering with the appropriate departments within your university, you can and should look beyond. If your institution doesn’t have a law school, partner with another one that does. Feel free to remind them that partnering with you is good for their law school, as it boosts their patent law program. Creating a startup is sometimes necessary for technologies that have market potential but are too early stage to interest an established company. Students can play a role in getting these startups off the ground. 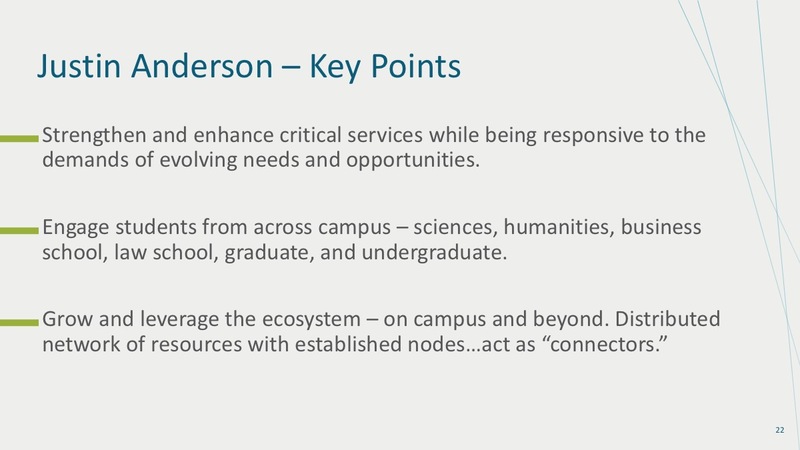 BTW, you don’t have to be a university TTO for this approach to be useful. This partnership between NASA’s Armstrong Flight Research Center and Cal Poly Pomona is a great example. When I asked the audience if they would be interested in an AUTM Special Interest Group (SIG) on this topic, almost every hand went up. I passed along this interest to AUTM. As a result, a Classroom Connections SIG will soon launch for AUTM members. If you’re interested in engaging in the ongoing discussion, which I will be moderating, join the SIG. Once it’s available, you can sign up by logging in to AUTM, go to the My Member Profile page, and click the SIGs tab.